At the end of July the Yemen conflict seemed poised to take on much broader regional and global dimensions, as Saudi Arabia halted oil shipments through the Bab al-Mandeb Strait off Yemen’s Red Sea coast. Iran declared the sea “no longer secure,” and Israel threatened military intervention if Houthi forces attempted to close the strait to shipping (see ‘Riyadh Halts Bab Al-Mandeb Oil Shipments After Houthi Attacks’). Earlier in July, the Saudi-led military coalition and associated ground forces had temporarily halted their campaign to dislodge Houthi fighters from Hudaydah city and capture Yemen’s busiest port. The United Nations Special Envoy for Yemen Martin Griffiths spent the rest of the month shuttling between the various stakeholders in the conflict in a flurry of diplomatic efforts to stop the campaign from resuming. European diplomats also stepped up their efforts to intervene in the Yemen conflict through July (see ‘European Diplomats Expand Outreach to Houthi Leaders’). By the end of the month, the positions of the warring sides appeared to be irreconcilable: Houthi leaders continued to insist that their forces would remain in the Red Sea city, though they had agreed to hand control of the port to the UN; the coalition and the internationally recognized Yemeni government, however, maintained their demand that Houthi forces unconditionally withdraw from Hudaydah city and governorate. In early August, Griffiths then told the UN Security Council (UNSC) that the situation in Hudaydah could only be addressed through a broader, comprehensive peace deal and announced plans for UN-led consultations between the main warring parties to begin on September 6 in Geneva, Switzerland (see ‘UN Special Envoy’s Shuttle Diplomacy’). 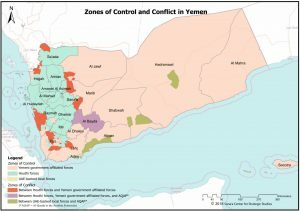 The Hudaydah campaign’s wider ramifications became evident last month (see ‘Offensive Displaces More Than 300,000, Red Sea Imports Drop’ and ‘Attacks Against Civilians and Civilian Infrastructure’), while relief agencies readied themselves for the campaign against the city to restart (see ‘UN Prepares for Imminent Siege, Boosts Medical Supplies’). Meanwhile, international opposition to the coalition’s actions continued to build (see ‘US Democrats Pressure Coalition on Hudaydah’, ‘Congress Debates Bill Placing Conditionality on US Refueling of Coalition Aircraft’ and ‘French Parliamentarians, Civil Society Raise Pressure Over Arms Sales’). Elsewhere in Hudaydah governorate military actions continued in July, among them the coalition’s advance on the Houthi-held town of Zabid, a UN World Heritage Site (see ‘Fighting Continues in Hudaydah Governorate’). Houthi forces in turn claim to have deployed hitherto unseen military drone capacities against Yemeni government forces and the coalition (see ‘Houthi Forces Deploy New UAVs’). In southern Yemen, there was a wave of assassinations against high-level security officials in Aden, the Yemeni government faced continued opposition to its political and military authority – particularly from the secessionist Southern Transitional Council – and there were protests over the coalition’s presence in al-Mahra governorate. Also in Aden, scores of detainees were released from detention facilities run by Emirati-backed local forces. In economic developments, the Aden-based Central Bank of Yemen approved an official exchange rate with which to support the import of basic commodities, the Yemeni rial experienced steep depreciation, and oil exports from Shabwah governorate restarted. Also last month, the UNSC discussed the UN Secretary-General’s annual Children and Armed Conflict report. As with last year, every major belligerent party to the Yemen conflict was cited for grievous violations against the rights of children. And for a second last year, the document included an annex for those parties that had taken step to try and address their violations against children. The Saudi-led military coalition and the Yemeni Armed Forces were listed in this special annex. The United Nations Special Envoy for Yemen Martin Griffiths continued his shuttle diplomacy throughout July, visiting the main stakeholders in the Yemen conflict in an attempt to avert a battle for the Houthi-held Red Sea city of Hudaydah. The United Arab Emirates (UAE), which is supporting and commanding local ground forces in a campaign to take the city, announced a “pause” in the assault on July 1, stating that the move was to give Griffiths a window opportunity to pursue negotiations. UN agencies and member states, humanitarian organizations and many other observers consider the continued functioning of the ports of Hudaydah and nearby Saleef – through which most of Yemen’s commercial and humanitarian goods enter the country – as crucial to preventing the country from descending into mass famine. To this effect an independent group of 22 of the most prominent Yemeni experts in various socio-economic fields issued a joint letter warning of “catastrophic” consequences if the military conflict in Hudaydah continues to escalate. This group – known as Yemen’s Development Champions – included former ministers of oil and minerals, transportation, trade and industry, agriculture, civil service, and tourism, as well as leading economists, bankers, businessmen and academics. They called on all belligerent parties to de-escalate the situation around Hudaydah, cooperate with the UN Special Envoy, and specifically for the European Union to step up support for the Special Envoy’s efforts. The following day, Griffiths briefed the UN Security Council (UNSC) via video-teleconference in a closed-door consultation. This was the only meeting on the situation in Yemen at the UNSC in July. Also joining the briefing was the operations director of the UN Office for the Coordination of Humanitarian Affairs (OCHA), John Ging. Following the briefing, council president for July, Swedish Ambassador Olof Skoog, delivered the UNSC’s press statement. He reiterated the council’s call for the ports of Hudaydah and Saleef to “be kept open and operating safely” given the humanitarian situation, reaffirmed the council’s support for the Special Envoy’s peace efforts, and called on the warring parties to work with him. On July 8, Griffiths announced via Twitter that he had held constructive meetings with Saudi officials in Jeddah. Griffiths said his Saudi hosts had expressed support for his efforts and “the prospects for resuming intra-Yemeni negotiations to reach a political settlement for the conflict.” On July 10, the Special Envoy travelled to Aden where he met with Yemeni President Abdo Rabbu Mansour Hadi. On July 17, various Yemeni parties voiced their positions publicly. Houthi leader Abdulmalek al-Houthi said his movement was willing to hand Hudaydah port over to UN supervision, on the condition that the Saudi-led military coalition halt its offensive. The same day, Yemen’s foreign minister Khaled al-Yamani reiterated demands that the control of the port and city be delivered to the Hadi government’s interior ministry and security institutions, and that Houthi forces unconditionally withdraw from the entire Red Sea coast. Griffiths met with United States Secretary of State Mike Pompeo to discuss negotiations regarding Hudaydah in Washington D.C., on July 19.. In a State Department press release following the meeting, Pompeo expressed his support for the UN Special Envoy’s initiatives and his desire for all sides to come to a comprehensive political agreement. In Washington, Griffiths also met with Khaled bin Salman, the Saudi ambassador to the US and the brother of Crown Prince Mohammed bin Salman. On July 26, the UN Special Envoy visited Sana’a again, where he met with Mahdi al-Mashat, President of the Supreme Political Council (SPC), the governing body that presides over Houthi-controlled areas. Following this, Griffiths was in Kuwait where he met the Emir of Kuwait, Sheikh Sabah al-Ahmad al-Jaber al-Sabah, and Kuwaiti foreign minister Sheikh Sabah al-Khalid al-Sabah. The Special Envoy said afterward that Kuwait has an important role to play in resolving the Yemen conflict. Kuwait is part of the Saudi-led military coalition and is a non-permanent member of the UNSC for the 2018-19 term. The country also host the two previous rounds of UN-led peace talks regarding the Yemen conflict. Despite this shuttle diplomacy, by the end of July, the parties to the conflict continued to be at an impasse regarding Hudaydah. Houthi officials had agreed in principle to turn over the port to UN administration; Sana’a Center sources have indicated that this was based on the understanding that customs revenues from the ports would be directed to the CBY in Aden to facilitate the payment of civil servant salaries in northern parts of Yemen. The Houthi leadership, however, insisted on maintaining control of Hudaydah city. The Saudi-led military coalition and the Yemeni government continued to insist that Houthi forces unconditionally hand over the port and withdraw from the city and governorate. On August 2, Griffiths was in New York, where he briefed the UNSC. He shared the results of his discussions with Yemen’s warring parties on the situation in Hudaydah and on resuming peace-talks. The Special Envoy said that despite some progress on averting a battle for the city and port of Hudaydah, his office had yet to secure an arrangement between the belligerent parties for such. Griffiths said he was now convinced that the situation in Hudaydah governorate has a better chance of being addressed within the context of a comprehensive political settlement. He announced plans to invite the main warring parties for UN-led consultations scheduled for September 6 in Geneva, Switzerland, to discuss the framework for negotiations and confidence-building measures. The Special Envoy said that consultations would be inclusive and engage with women’s groups and southern stakeholders, among others. Notably, for the last two years – since the collapse of UN-mediated peace talks in Kuwait on August 6, 2016 – there have been no official negotiations between the main belligerents in the Yemen conflict. In a July 9 letter, top Democrats urged Saudi Arabia and the UAE to drop their demand for an unconditional Houthi withdrawal from Hudaydah port and the city itself. The letter said the coalition’s “pause” in the assault on Hudaydah had created a “diplomatic opening” and the legislators called on the coalition members to allow the UN Special Envoy this opportunity to try and restart peace negotiations. The letter noted the coalition’s stated rationale for the assault on Hudaydah – to deny the Houthis revenues from import duties and weaken them strategically to force them to the negotiating table. However, the legislators pointed to current assessments they had received suggesting an attack on Hudaydah would accomplish neither of these goals. Rather, they noted in the letter that Houthi forces required only “modest” financial means to continue fighting, that previous major coalition assaults had failed to “provide deescalation opportunities,” and that the current coalition plans to address the ramifications of the attack were inadequate to prevent severe humanitarian fallout. The signatories were House Democratic Whip Steny Hoyer (D-MD); Eliot Engel (D-NY), Ranking Member, Committee on Foreign Affairs; Nita Lowey (D-NY), Ranking Member, Committee on Appropriations; Adam Schiff (D-CA), Ranking Member, Permanent Select Committee on Intelligence; and Ted Deutch (D-FL), Ranking Member, Subcommittee on the Middle East and North Africa. Throughout July, military operations on the Red Sea coast continued in Hudaydah governorate, though clashes tended to be short and intense, rather than prolonged battles. On July 6, the coalition-backed Giants Brigades reported that they had taken control of most areas of al-Tuhita district, south of Hudaydah city, and had cut off a road connecting Hudaydah’s Zabid and al-Tuhita districts. Other anti-Houthi forces also continued their advance toward the town of Zabid, Hudaydah governorate’s second most-populated urban area located roughly 100 km southeast of Hudaydah city. As of the end of July, the UN had Zabid listed as a World Heritage in Danger. Yemeni government Foreign Minister Khalid al-Yamani and UAE Minister of State for Foreign Affairs Anwar Gargash made statements on July 22 and 24, respectively, saying fighting for Hudaydah city would resume shortly, should the UN fail to negotiate a prompt Houthi withdrawal. On July 27, the Saudi-led military coalition launched airstrikes on targets in the center and the north of Hudaydah city, hitting a Houthi security facility and a factory, according to reports from residents. Houthi-affiliated media outlets said a radio station building and a fishing pier were also hit. The International Rescue Committee stated a reproductive health center was also damaged in the bombings, forcing the suspension of its operations. Between June 1 and July 24, Operation Golden Victory – the coalition-backed campaign to capture Hudaydah city – displaced more than 300,000 people in Hudaydah governorate, according to both the International Organization for Migration (IOM) and OCHA. Most people were displaced from or within Hudaydah city, followed by districts south of the city, such as al-Durayhimi. While about one third of these internally displaced people (IDPs) have stayed within Hudaydah governorate, the rest have fled, mostly to Sana’a city. It is likely that actual displacement figures are higher, given difficulties in reaching and registering these new IDPs, a challenge reported by humanitarian agencies. Reports indicate that belligerent parties have blocked roads, impeding the work of humanitarian organizations and hampering the movement of those trying to flee frontline areas, and Houthi forces have also reportedly actively prevented civilians from fleeing. All these actions could constitute a violation of international humanitarian law. Through June and July, the offensive on Hudaydah also caused a significant decrease in the level of imports and the number of vessels berthing at Hudaydah and Saleef ports. Notably, food imports through the UN Verification and Inspection Mechanism (UNVIM) – which helps oversee cargo shipments to Yemen’s Red Sea ports – have dropped from 409,321 metric tons (MT) in May to 287,857 MT and 235,029 MT in June and July, respectively. The number of vessels berthing at these ports dropped from 31 in May to 21 and 17 in June and July, respectively. Since December 2017, only one containerized cargo vessel has reached Hudaydah port, which happened prior to the current offensive. As of the end of July, UN agencies were expecting and preparing for a siege of Hudaydah city, which included negotiating with Houthi authorities to allow for the large-scale distribution of essential goods. As well, seven airplanes, chartered by the World Health Organization (WHO), delivered 168 tonnes of medicines and medical supplies to Sana’a airport in mid-July. The majority of these supplies were to be transported to Hudaydah governorate. Although the WHO reported that 91 percent of Hudaydah’s health facilities were still functioning as of early July, by July 22 the IOM was reporting that security concerns had led to a number of temporary closures. Those still running faced challenges such as staff shortages and electricity cuts, while having to shoulder increased demand for services due to a spike in casualties. Throughout July, the offensive on Hudaydah city and hostilities in other parts of the governorate continued to impact civilians, notably in al-Tahita and Zabid districts to the south of Hudaydah city. Airstrikes hit densely populated areas, such as al-Hawak and al-Hali districts in Hudaydah city, and protected civilian infrastructure, such as a prison, water reservoirs and a warehouse containing humanitarian supplies. Between July 26 and 28, airstrikes hit and damaged Hudaydah city’s main water reservoir, located in al-Mina district, as well as a sanitation facility in Zabid district. Airstrikes in Hudaydah governorate also caused civilian casualties. On July 10, airstrikes reportedly hit two vehicles in al-Garrahi district killing six civilians, including a child. On July 19, indiscriminate artillery shelling in Wadi al-Qawm village, al-Durayhimi district, reportedly killed five and injured three people, including children. A coalition airstrike on a school in Zabid city killed three and injured four, including a child, in early July, according to the Houthi-affiliated al-Masirah newspaper. On July 23, the Senate and House Armed Services Committee released their annual defense policy bill that would place conditions on US military support for the Saudi-led military coalition in Yemen. Under Section 1290 of the National Defense Authorization Act (NDAA) for 2019, for this support to continue the US Secretary of State would be required to certify the coalition’s commitment to finding a political solution to the conflict, improving humanitarian access, and reducing the risk of harm to Yemen’s civilian population. A waiver was included for operations against Al-Qaeda in the Arabian Peninsula (AQAP) and ISIS. Of note, the UAE was named in the conference report alongside Saudi Arabia, while previous versions of the bill in the House and Senate referred to “Saudi Arabia and its coalition partners.” In addition, Section 1274 of the bill would mandate a review of US actions in Yemen — both direct or via support of the Saudi-led military coalition — to determine whether such operations have violated US law or defense policy on the protection of human rights. The nature of interrogations in Yemeni prisons were specifically highlighted in the bill. In June, the White House said it “strongly objects” to a provision that would place conditionality on support for the Saudi-led military coalition, saying the certification requirement did not acknowledge support Iran provides to Houthi forces. However, the White House did not indicate that it would seek a presidential veto over the provision. Congress passed the NDAA on August 1, with the bill now moving to the president for review, to either be vetoed or signed into law. On June 30, the Special Envoy of the Swedish Ministry for Foreign Affairs to Yemen, Ambassador Peter Semneby, visited Sana’a and met with Mahdi al-Mashat, President of the Supreme Political Council in Sana’a. Several days later, on July 4, Antonia Calvo, Head of the EU Delegation to Yemen, was also in Sana’a where she met with al-Mashat and Houthi leader Abdulmalek al-Houthi. On July 18, a French delegation led by the ambassador to Yemen, Christian Testot, also met with Houthi officials in Sana’a. According to a French Ministry of Europe and Foreign Affairs (MEFA) statement made to Le Figaro, talks centered around humanitarian issues. However, the French newspaper cited an unnamed source as saying the parties also negotiated over the release of Alain Goma, a French citizen. Goma was attempting to sail from France to India. In June, while sailing the Red Sea, he was forced to make an emergency stop in Hudaydah port, where he was subsequently detained by Houthi forces. On July 4, the French Ministry of the Armed Forces released its annual report on arms sales. It was presented to and discussed by the parliament’s National Defense and Armed Forces Committee, which questioned Florence Parly, Minister of the Armed Forces at a hearing. Among other things, the report outlined the number and cost of licenses for arms exports that France had issued in 2017. With licenses worth more than €14.7 billion, €7.9 billion and €5.2 billion, respectively, Saudi Arabia, Egypt and the UAE ranked first, fourth and sixth in the value of their French arms export licences last year. During the hearing, several members of parliament (MPs) raised the issue that these weapons, sold to members of the Saudi-led military coalition, might be used for military activities that violate international humanitarian law or facilitate such violations in Yemen. Answering respective questions, Parly referred to the robust and “very strict” control the executive has over French arms sales. She stressed that arms sold to Saudi Arabia in the past were solely being used for defensive purposes along the Saudi-Yemeni borders. Among other justifications, she mentioned the need to protect the 30,000 French nationals living in the region and the Emirati contribution to the fight against terrorist groups in Yemen, which posed a direct threat to France, she said. Two weeks later, the parliament’s Foreign Affairs Committee also addressed French arms sales to belligerent parties in the Yemen conflict, holding a hearing on the control of arms exports from member states of the European Union (EU). MPs of various political parties supported the establishment of a parliamentary commission of inquiry on French arms sales to warring parties in Yemen. This had been proposed by Sébastien Nadot, MP for the ruling La République En Marche party, in a draft resolution, co-sponsored by 90 of 577 MPs as of July 18 and supported by human rights organizations, including Amnesty International and Human Rights Watch. During the hearing, Marielle de Sarnez, chair of the committee and MP for the centrist Mouvement Démocrate party, refused to put the draft to a vote, arguing that the necessary procedural requirements were not met. She proposed alternative, though weaker, ways to enhance parliamentary scrutiny over arms sales. On July 8 and 9, two UK ministers resigned in protest of Prime Minister Theresa May’s Brexit policy. This included UK Foreign Secretary Boris Johnson, who stepped down after two years in office. He was replaced by Jeremy Hunt, the former health secretary. Hunt’s stance on UK foreign policy toward Yemen and the region is yet unclear, though no major changes are expected. The UK became UNSC penholder for Yemen in 2011, responsible for drafting the council products related to Yemen. July 9: The UN Panel of Experts on Yemen submitted to the 2140 Yemen Sanctions Committee a study regarding two Houthi attacks on commercial shipping in the Red Sea – against a Saudi oil tanker on April 3 and a Turkish-flagged vessel transferring wheat on May 10 – using anti-ship missiles. The study was not made public. 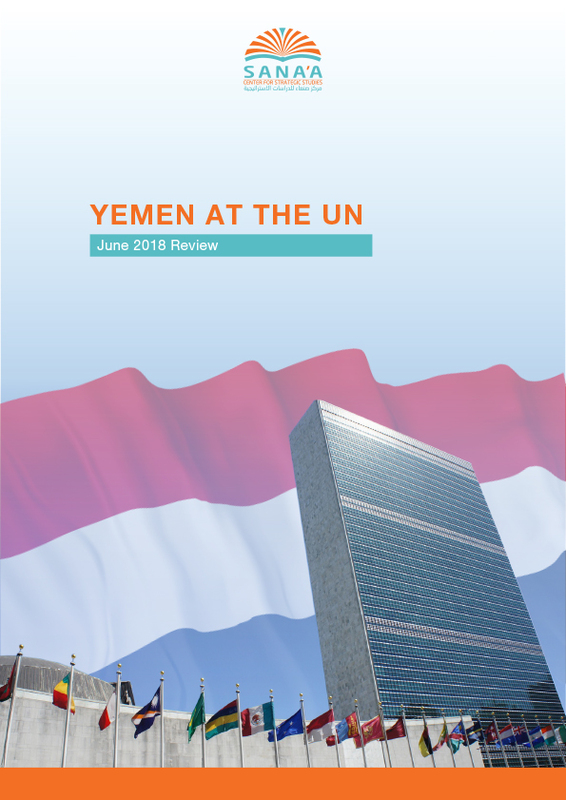 July 27: The 2140 Yemen Sanctions Committee received a mid-term update report from its independent UN Panel of Experts. The Sanctions Committee is scheduled to meet on August 10 to consider the mid-term update. Throughout July, competition for influence in Yemen’s southern governorates came to the fore. This was in regard to both security responsibility — with the Yemeni government facing challenges specifically in Hadramawt governorate — and political control, demonstrably in the Southern Transitional Council’s (STC) renewed calls for an independent state in the south. On July 5, the STC called on the Hadrami Elite Forces to take control of security in Saiyun, Hadramawt. The move constituted a direct challenge to the commander of the First Military Region Maj. Gen. Saleh Temes, whose forces — affiliated with Yemen’s vice president Ali Mohsen al-Ahmar — are responsibile for security in the governorate’s north. The STC cited the failure of Hadi-backed security forces in stemming a wave of murders, robberies, land seizures and other criminal activity in the Hadramawt valley, as well as the presence of northern fighters in their ranks. Saiyun is the main town in the Hadramawt valley, has an airport, and is the location of the government’s First Military Region headquarters. On July 17, STC spokesman Salem Thabet al-Awlaki said the STC rejects the presence of northern military forces in southern governorates, reportedly a reference to Tariq Saleh’s National Resistance Forces. In a speech on July 15, the commander of the UAE-backed Hizam al-Amni, or Security Belt forces, first brigade Brig. Gen. Munir Mahmoud al-Yaf’i, accused the Yemeni government — specifically President Hadi and Prime Minister Ahmed Obaid bin Dagher — of corruption and said they would be expelled from the south “within days.” Shortly after the speech, Hadi reportedly deployed armored vehicles around al-Masheeq Palace in Aden, where Hadi was residing in July. On July 10, the STC staged a meeting of its National Assembly – consisting of representatives from across southern governorates – in Aden. Following this, the STC announced its objective to create a new federal state in southern Yemen, based on pre-unification borders. In a statement, the STC referred to the “remnants of northern military forces” in Hadramawt, Shabwah and Abyan governorates, calling their presence “undesirable” and advocating their replacement with southern security forces. The STC also called for the dismissal of the current Hadi administration, mentioning corruption, poor governance and the persistent economic crisis. The council announced the creation of a number of committees mandated with establishing the foundations of the new state — including the drafting of a new constitution, the construction of security bodies and defense and interior ministries, and the hosting of a “southern dialogue conference” to reach a consensus among various actors in the southern governorates. On July 19, STC President Aiderous al-Zubaidi gave an interview in which he reiterated calls for a new state. In late June and early July, protests were reignited in the city of al-Ghaydah, al-Mahra governorate over the coalition’s imposition of military control over various points of entry into the governorate. Demonstrations originally began in April, resuming June 23 with the end of Ramadan. In what it said was an effort to curb arms smuggling to Houthi forces through the governorate, which borders Oman, the coalition had used local Yemeni proxy forces to seize control of Nashtoon port, Shahn and Sarfit border crossings, and al-Ghaydah airport in November 2017. Locals, however, said this amounted to trade restrictions on al-Mahra and demanded the entry points be returned to local control. Protests ended mid-month when the coalition agreed to return control of al-Ghaydah airport to local authorities. Saudi-backed forces then reportedly secured a key checkpoint at the entrance to al-Ghaydah city on July 17. On June 20, Mahdi al-Mashat, of the Houthi SPC in Sana’a, wrote a letter to Russian President Vladimir Putin calling for assistance in negotiating a political settlement to the conflict. Four days later, the Yemeni Under-Secretary of State for Political Affairs, Mansour Baggash, met with Russia’s Ambassador to Yemen, Vladimir Dedushkin, in Riyadh, Saudi Arabia. According to a foreign ministry statement, the ambassador reiterated Russia’s support for the internationally recognized government and a political solution to the conflict. Russia has made indications this year that it is interested in a role as a mediator in the conflict. In January, the Russian foreign ministry offered to broker talks between the warring parties and made a similar proposal regarding rival factions in the south. July 9: Yemen’s foreign minister Khalid al-Yamani criticized Hezbollah’s statement of support for the Houthi movement in a letter to the Lebanese foreign minister, Gebran Bassil. On June 29, Hezbollah Secretary-General Sayyed Hassan Nasrallah denied reports that coalition airstrikes had killed eight of his fighters in Yemen, but declared his support for the Houthi forces in the conflict. July 16: During a meeting with US Ambassador to Yemen Matthew Tueller, Yemen’s Prime Minister Ahmed Obaid bin Dagher said that the Hadi government would not engage in peace talks until all prisoners held by Houthi authorities were released. July 25: Anti-Houthi news sources reported that the Houthi leadership was attempting to replace the leaders of the Sana’a-based GPC faction with loyalists or senior Houthi figures. This included installing Houthi Prime Minister Abdul Aziz bin Habtour as the GPC secretary-general, and tribal leader Zaid Abu Ali as head of the party’s parliamentary bloc. On July 26, Saudi authorities announced that they had suspended oil shipments through the Bab al-Mandeb Strait following a Houthi attack on two Saudi oil tankers in the 20-km-wide sea corridor the previous day. In a statement, the Saudi Aramco said one of its vessels had sustained “minimal damage.” On the same day, the head of Iran’s Quds force, Qassem Soleimani, said in a speech that the Red Sea is “no longer secure” given the presence of US troops in the area. Following the Saudi announcement, Kuwait and the UAE also considered suspending oil shipments through the strait, Saudi media reported. Adding to uncertainty around shipments out of the Persian Gulf, Maj. Gen. Mohammad Ali Jafari of the Iranian Revolutionary Guard Corps (IRGC) said on July 5 that the IRGC would be ready to close the Strait of Hormuz if the US blocked oil exports from Iran. The US State Department has said that resumed sanctions on Iran’s oil sector will come into force this November, following Washington’s withdrawal from the Iran nuclear deal. On July 31, the head of the Houthi’s Supreme Revolutionary Committee, Mohammed Ali al-Houthi, announced a unilateral cessation of military operations in the Red Sea for a period of two weeks beginning midnight August 1. Al-Houthi added that the pause, which he said was to support UN-brokered peace efforts, “could be extended and include all fronts if this move is reciprocated by the leadership of the coalition.” The Houthi defense ministry later confirmed the decision. On August 1, Israeli Prime Minister Benjamin Netanyahu then announced that he would send military forces to intervene “if Iran will try to block the straits of Bab al-Mandeb.” Implicit in his statement was the erroneous conflation that the Houthis are Iranian proxies. This is the first time Israel has threatened to directly assert itself in the Yemen conflict. July 3: Unidentified gunmen killed Colonel Wadah Jahori, Commander of al-Shaab Police Department and his bodyguard. Jahori had launched a number of counterterrorism operations over the past year in Aden city, according to a local government official. July 12: Unidentified gunmen killed Colonel Fahmi Al-Subaihi, the chief of the Bier Fadhl Police Department. July 14: Shalal Ali Shaya, Aden city’s director of police survived an IED attack on his convoy while he was travelling to the Brega coalition base in al-Buraiqa district, Aden governorate. July 17: An Islah party leader, Sadiq Ahmed Mohammed, survived an assassination attempt by unidentified gunmen in the al-Qaloua neighborhood of the city. July 24: An IED attack targeted Colonel Rami Mohammed Muthanna al-Samidi, Commander of the Fourth Battalion of Aden’s security department, in the Enma neighborhood. Three civilians were killed and Samidi was injured in the attack. Hours later, the director of al-Basateen Police Department, Colonel Musleh al-Dhahrani, survived an assassination attempt after unidentified gunmen opened fire on his vehicle. July 26: Unidentified gunmen killed Imam Mohammed Ragheb Bazraa in al-Mualla district. Bazraa was affiliated with the pro-Hadi Islah party. July 29: Unidentified gunmen killed Colonel Nasser Makrij, head of intelligence at Aden airport, near his home in Aden city. July 31: In the city’s Mualla district an IED exploded in an apparent assassination attempt targeting Islah party leader Arif Ahmed Ali. Ali, his son, and two others were injured in the incident. On July 2, Houthi forces released a video showing an unmanned aerial vehicle (UAV) dropping explosives on UAE-backed forces 45 kilometers south of Hudaydah city. On July 5, Saudi-led military coalition forces shot down a UAV that had bombed the coalition-backed forces’ Brega base in al-Buraiqa district, Aden governorate — the first time a Houthi drone has hit targets in Aden. On July 18, Houthi forces claimed that they attacked a Saudi Aramco oil refinery in Riyadh using a long-range drone. Aramco said that a fire at the site had been caused by an “operational incident.” On July 26, Houthi forces claimed they attacked Abu Dhabi airport using another UAV. The UAE denied this claim. On July 18 Houthi forces claimed to have shelled a military training camp in Marib governorate, killing Brig. Gen. Mohamed Saleh al-Ahmar, Yemeni Vice President Ali Mohsen al-Ahmar’s brother-in-law and the military attaché for the Yemeni Embassy in Bahrain. The vice president was also present in the camp at the time of the alleged attack but was unharmed. Yemeni government media denied that an attack took place and said the commander was killed by a bomb explosion during an army drill. July 5: Houthi forces published a video online of an underground missile launcher that they claimed cannot be targeted by Saudi aircraft, shortly after announcing the “robust and efficient development” of their ballistic missile program. July 6: A US airstrike on a vehicle in Bayhan district, Shabwah governorate, killed seven AQAP militants, local media reported. July 12: A Houthi defense ministry official said their forces downed a Saudi fighter jet that was returning from a mission in Sa’ada governorate. The Saudi-led coalition said that one of its Tornado fighter jets had crashed in the Asir region, Saudi Arabia, due to a technical fault, and that the two personnel onboard survived the crash. July 11: AQAP released a statement claiming three attacks in al-Bayda governorate in the first 10 days of July, resulting in the death of eight Houthi fighters, including a commander. July 11: The so-called Islamic State group, or Daesh, and AQAP militants clashed in Qayfa, al-Bayda governorate, according to local tribal sources. The incident was reported as the first time the two groups had engaged in armed clashes. Later, on July 15, Daesh released a video purportedly showing 12 captured AQAP members. In response, a prominent sheikh and former AQAP judge in Taiz called for the killing of ISIS militants in Qayfa. July 15: A Houthi-launched projectile targeting the city of al-Aridha in the Jizan border region of Saudi Arabia injured three civilians, according to a Saudi civil defense spokesman. July 21: Pro-Hadi forces announced significant advances in Baqim district, Sa’ada governorate, saying they have taken control of the center of the district, located on the road between the Saudi border and Sa’ada city. July 22: A US airstrike killed four suspected AQAP militants travelling in a vehicle in Sirwah district, Marib governorate. On July 12, the Aden-based CBY approved an official exchange rate with which to provide importers with foreign currency to support the import of five key commodities – rice, wheat, sugar, milk and edible oil. The CBY had finished drafting the framework for the support mechanism in June, which will make use of US$2 billion in Saudi financial aid made available to the CBY in April this year. A committee chaired by CBY governor Mohammad Zammam – which included representatives from the banking sector, chambers of commerce and industry, and authorized exchange institutions – agreed upon a rate of 470 Yemeni rials (YR) to the US dollar for letters of credit to guarantee payment for imports. Banking sources indicated that by surrendering its sole privilege to set the exchange rate and including private actors in the decision, the CBY in Aden is hoping the set rate will have a greater chance of being adhered too. The committee also agreed to biweekly assessment meetings to adjust the exchange rate as required. On July 31, the CBY Board of Directors approved the first withdrawal of US$20.4 million from the US$2 billion Saudi deposit, to fund the letters of credits for the import of basic foodstuffs. On the last day of the month, the CBY also approved the second batch of bank applications to fund the letters of credits from the Saudi deposit. It should be noted that interventions in the currency market below $100 million generally do not impact the YR exchange rate. Over the course of July, the YR lost as much as 6 percent in value, trading as low as YR 520 to the US$ in Sana’a and YR 530 in Aden at month’s end, down from YR 490 to the US$ at the end of June. 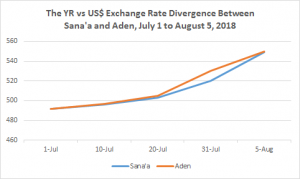 As of August 5, the rial was trading at YR 550 to the US$ in both Sana’a and Aden, according to currency exchange traders interviewed by Sana’a Center economists. Also, in response to the rial’s depreciation, a number of foreign exchange traders in Aden suspended exchange transactions to avoid losses as a result of expected foreign exchange currency fluctuation. Nationwide, some traders bought hard currency at lower rates and suspended selling to the public. Aden-based banking sector specialists told Sana’a Center economists that a key reason for the downward pressure on the YR was the delay in finalizing procedures for the pre-reimbursement of letters of credits (LCs), which require Saudi approval. Compounding this is the limited range of imports the LCs cover, as they exclude other foodstuffs, medication, oil derivatives, and all non-essential materials. Between March and May 2018, the YR had stabilized, trading in the parallel exchange market at YR 480 to 485 per US$. The Sana’a Center’s economic unit found that this stabilization was due to some degree to the announced arrival of the US$2 billion Saudi deposit. To a larger degree, however, there appeared to be low demand for foreign currencies in March and April of 2018, with traders having imported and accumulated sufficient food stocks in the preceding months to meet the increased consumer demand during Ramadan (mid-May to mid-June). Lower food importation in March and April, however, meant food inventories were being depleted during this time. In response, through May and June importers began buying foreign currency through the parallel exchange market to import foodstuffs and replenish the food stocks. In addition, there was increased demand for dollars to import clothes, oil derivatives, and other commodities to meet the higher demand for such that accompanies Eid al-Adha, the Muslim “Festival of Sacrifice” celebrated on August 21, 2018. On August 1, Yemen’s oil and minerals ministry announced that 500,000 barrels of oil had been exported from Shabwah in southeastern Yemen — the first from the governorate since the conflict began. The shipment — reportedly worth US$35 million — left Rdhom port on July 28, according to a Sana’a Center source, and was purchased by the Chinese company Katy Petroleum. The ministry added that Shabwah would receive 20 percent of the revenue from the shipment. This is similar to the revenue sharing agreements the government has arranged with Marib and Hadramawt regarding oil sales. Sources in the energy sector indicated that the Austrian oil company OMV resumed its operations in mid-April 2018 with a production capacity of 8,000 barrel per day (bpd), which rose to 13,000 bpd by mid-July. OMV ceased operations in 2015 with the outbreak of the conflict, prior to which it produced around 20,000 bpd. July 4: OCHA reported that the Global Taskforce on Cholera Control had approved an oral cholera vaccination campaign to be conducted in six districts of Hudaydah governorate, including Hudaydah city. As of the time of writing, however, Sana’a Center sources had indicated that recent coalition airstrikes in Hudaydah may have effectively paralyzed the UN cholera program in the city. July 6: UAE Minister of State for International Cooperation Reem al-Hashimy wrote a letter (S/2018/675) to the UN Security Council with an update on the humanitarian situation and the Saudi-led military coalition’s contingency plan for Hudaydah. The plan outlines the emergency provision of humanitarian needs for some 6 million people for a month, with a focus on preparing alternative entry points for humanitarian and commercial access into Yemen. On July 17, the UK mission to the UNSC hosted a closed-door meeting of council member states with al-Hashimy to discuss the contingency humanitarian plan. July 12: IOM facilitated the voluntary humanitarian return of 53 Ethiopian migrants, evacuating them from Hudaydah to Djibouti by sea. IOM frequently organizes the maritime evacuation of migrants and refugees from Ethiopia and Somalia, who generally intended to reach Saudi Arabia and other Gulf states. July 13: OCHA reported that, following the pause of the Hudaydah offensive, shops and bakeries reopened and the city’s main water pipeline was repaired, improving water supplies. The city’s food supplies, however, remained low, with prices having significantly increased since early July. July 26: The UN Refugee Agency reported that an unknown person had thrown a grenade into an IDP hosting site in al-Sheikh Uthman district, Aden governorate, killing two IDPs and injuring five. OCHA reported that three days later, an informal IDP settlement in Tuban district, Lahj governorate, was attacked – without giving further details – resulting in one casualty. Many IDPs from northern areas have been displaced to southern Yemen, where they often face discrimination. August 1: OCHA reported that US$1.8 billion out of the US$3 billion 2018 Yemen Humanitarian Response Plan (YHRP) had been funded, equaling 62.4 percent of the requested amount. On July 9, the council held a high-level open debate under the theme, “protecting children today prevents conflict tomorrow,” to coincide with the release of the UN Secretary-General’s annual report on Children and Armed Conflict (A/72/865–S/2018/465). For the second year running, the report includes two annex categories regarding actors that have violated the rights of children in armed conflicts around the world – the so-called “child killer list.” The “A” annex lists violators who have not put in place measures to improve the protection of children in armed conflict between January and December 2017, while the “B” category lists violators who have. In regards to Yemen, the “A” annex lists the Houthi forces (who are referred to as Ansar Allah in the report) for recruiting child soldiers, killing and maiming children, and attacking schools and hospitals. AQAP, the associated Ansar al-Sharia group, and various anti-Houthi militias are also listed in the “A” annex based on child soldier recruitment. The report’s “B” annex names forces associated with the Yemeni government, including the Yemeni Armed Forces, for recruiting child soldiers, and the Saudi-led military coalition intervening in the Yemen conflict, as a party that “kills and maims” children. In last year’s report, the Saudi-led military coalition was also listed in the “B” annex for attacking schools and hospitals; this year the coalition is no longer cited for this violation, despite the fact that the report documents the Saudi-led military coalition conducting 19 attacks on schools and five attacks on hospitals within the reporting period. All the above-noted actors were named in the two previous Children and Armed Conflict reports. However, in 2016, Saudi threats to withdraw hundreds of millions in UN aid funding resulted in then-UN Secretary General Ban Ki-Moon removing Saudi Arabia from the list. The creation of the “A” and “B” annex categories in last year’s report was seen as a compromise between the UN and Riyadh. 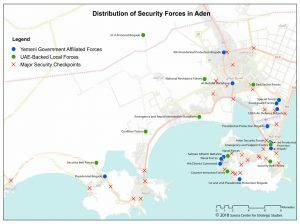 In late June and early July, more than 80 detainees were released from prisons run by UAE-backed forces in Aden, notably from the Beir Ahmed prison in Aden city and the former Wadah nightclub in al-Tawwahi district, which was converted into a detention and counterterrorism facility roughly a year and a half ago. On July 8, UAE Minister of State for Foreign Affairs Anwar Gargash denied the UAE controlled detention facilities in Yemen. In the meantime, the Yemeni Interior Minister Ahmed al-Maysari met with Emirati officials in the UAE and Aden to negotiate the closure of UAE-controlled detention facilities and their transfer to the Yemeni judiciary’s purview. Also on July 8, the Deputy Interior Minister Major General Ali Lakhsha visited the Wadah facility, which was aired on TV. However, the AP reported the buildings were painted and detainees were given new clothes and meals just prior to the visit. Lakhsha commented that there was no evidence of the existence of secret detention facilities outside the control of the government. Following angry reactions by relatives of the detainees, Lakhsha’s office released a statement on July 9, stating that the government was now in control of those facilities recently out of its authority. Security officials anonymously interviewed by the AP denied this. The same day, the UAE government denied these allegations, calling the report “politically motivated.” It claimed that prisons in Yemen were under the control of the Yemeni government and that the UAE had urged the latter to investigate the allegations. In early July, several journalists were detained or kidnapped by different forces across Yemen. On July 2, security forces in Aden city detained the chief editor of the local newspaper Aden Tomorrow, Fathi bin Lazraq, in the al-Mansoura area. The next day, the Yemeni Journalists Syndicate announced that Houthi forces had kidnapped journalist Abdusalam al-Daees, who was working for the Yemeni News Agency Saba in Sana’a. On July 7, unknown armed forces kidnapped the journalist Iyad al-Wasmani in Dhamar city. Fathi bin Lazraq was released after several hours, al-Wasmani after two days and Abdusalam al-Da’is in late July. On July 3, the Yemeni Journalists Syndicate released its mid-year report, in which it documented 100 violations of press freedom during the first half of the year. July 10: OCHA reported that an airstrike recently launched by the Saudi-led military coalition had hit a wedding in al-Dhaher district, Sa’ada governorate, killing 11 civilians, including nine children. July 10: The Saudi Press Agency announced that King Salman bin Abdulaziz al-Saud had issued a royal order pardoning military and disciplinary penalties against the kingdom’s military forces that had participated in the intervention in Yemen. Human rights groups have regularly accused the Saudi-led military coalition of violating international humanitarian law since it started its campaign in Yemen in March 2015. July 15: A Houthi affiliated court authorities in Sana’a sentenced four people to death for allegedly “contacting and supporting the enemy.” Human rights groups have cited how Houthi security services regularly arrest, imprison and put on trial those who have expressed dissenting views, or religious minorities. The charges are generally formulated as some form of national treason. July 17: Médecins Sans Frontières reported that mortar shelling at a market in Taiz city had killed three people and wounded nine.July 24: UNICEF reported that a water facility in Sa’ada had been attacked and damaged in the preceding week, depriving 10,500 people of safe drinking water. This report was prepared by Waleed Alhariri, Victoria K. Sauer, Ali Abdullah, Holly Topham, Wadhah Alawlaqi, Ghaidaa Alrashidy, Taima Al-Iriani, Maged al-Madhaji, Anthony Biswell, Farea al-Muslimi and Spencer Osberg.